Maryland Says Matthew Whitaker Appointment As Acting Attorney General Is Unlawful As part of an ongoing lawsuit over the Affordable Care Act, Maryland requested a preliminary injunction that would declare Rod Rosenstein the acting attorney general instead. Matthew Whitaker is pictured at an event in Washington in August. President Trump this month appointed Whitaker as acting attorney general. President Trump's choice of Matthew Whitaker to be the acting attorney general is running into a buzz saw of opposition, and not just from Democrats. And now, the first legal action is being filed Tuesday, by the state of Maryland, challenging Whitaker's status. Maryland's suit does not involve limits to asylum claims that Whitaker has already put into effect, nor any challenge involving the Mueller investigation of the president, which Whitaker has frequently criticized. Instead, the first blow involves the Affordable Care Act, its provisions guaranteeing that people with previous medical conditions are entitled to health insurance rates similar to others in their state or community. Under Attorney General Jeff Sessions, the Trump administration had stopped defending key parts of the Affordable Care Act in court on the grounds that the law became unconstitutional when Congress repealed the tax penalty for individuals' failure to buy health insurance. Maryland filed suit against Sessions challenging that position. But now that Sessions is no longer attorney general, Maryland is buttressing its argument. The state contends that Whitaker was unlawfully named acting attorney general, and so he has no authority to respond to its lawsuit. The state seeks a preliminary injunction that prevents the federal government from responding to the suit while Whitaker appears as acting attorney general. Instead, Maryland requests a declaration that Deputy Attorney General Rod Rosenstein is the acting attorney general. The state contends that under the Attorney General Succession Act, the deputy attorney general, or other confirmed Justice Department officers in a designated order of succession, must serve as acting attorney general until a new person is confirmed for that position by the U.S. Senate. Maryland also argues that Whitaker's appointment violates the Constitution, which requires that principal officers of the United States be appointed "with the Advice and Consent of the Senate." Whitaker was not serving in a Senate-confirmed position when he was appointed. Two former attorneys general from the George W. Bush administration — Alberto Gonzales and Michael Mukasey — have criticized the appointment of Whitaker. Mukasey told USA Today that in his view, the acting attorney general needs to be confirmed by the Senate. "Even Richard Nixon didn't put in somebody as acting attorney general who had not been confirmed," he said. Nixon's attorney general and deputy attorney general both resigned after refusing to carry out Nixon's order to fire Watergate special prosecutor Archibald Cox. And Gonzales, in an interview with NPR, said the appointment "confounds" him. 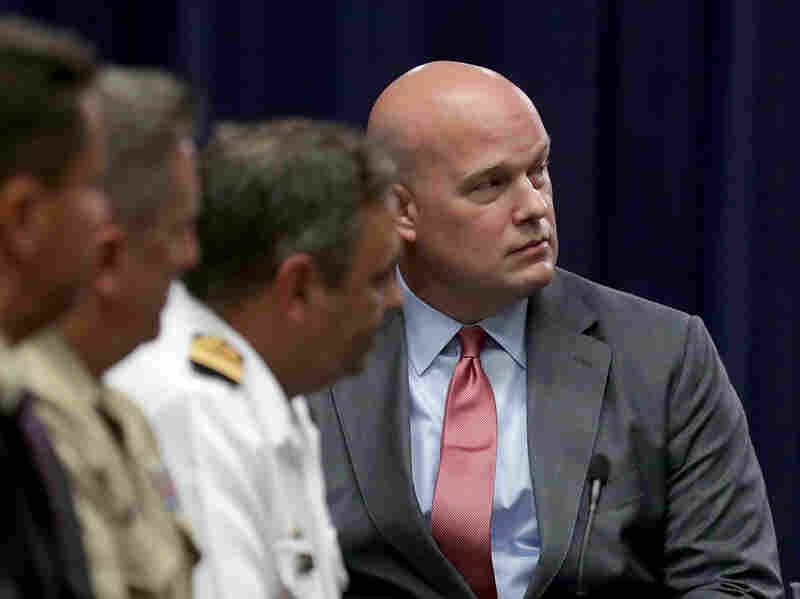 "Even if it is lawful, I question whether putting Mr. Whitaker in this position at this particular time was a wise move," he said, particularly in light of "his public comments about the Mueller investigation."